UAW organizers were getting ready to pose for a picture in front of the Ford sign at the Rouge Plant in Dearborn, when Ford’s security team approached them. The security team attacked them moments later. The scene was captured by Detroit News photographer James Kilpatrick. 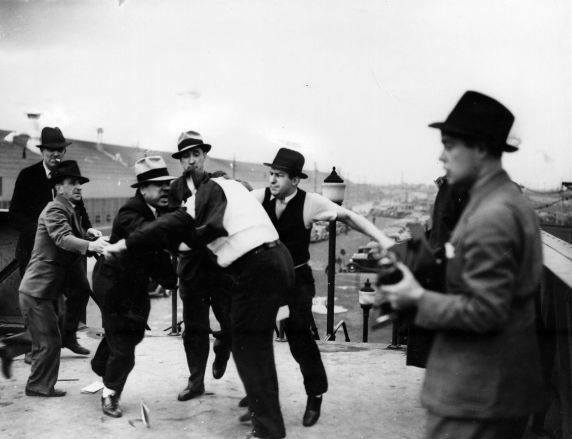 DEARBORN May 26, 2015– Today marks the 78th anniversary of a pivotal event in Michigan labor history: the Battle of the Overpass. 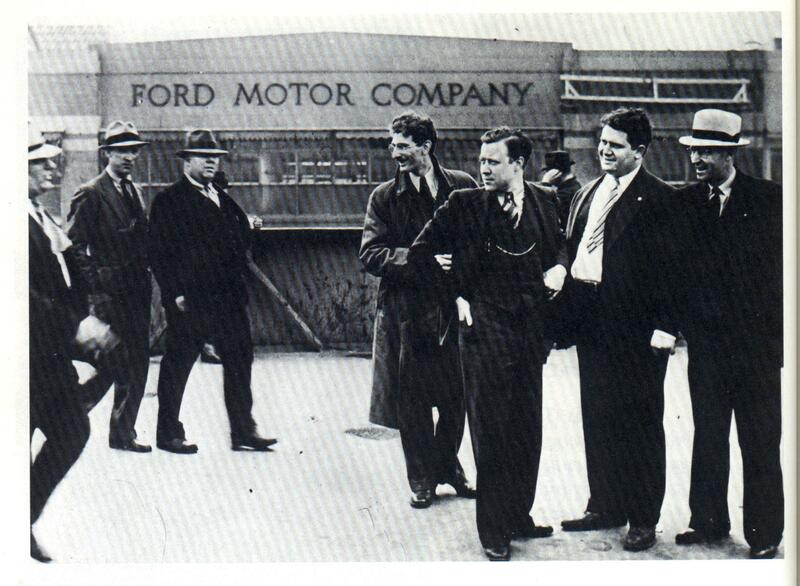 On May 26, 1937, UAW president Walter Reuther took a group of union organizers to the Ford Rouge Plant in Dearborn to flyer the afternoon shift change. The workers were fighting for a shorter work day and higher wages. Reuther expected around 9,000 men to cross the Miller Road overpass that day. At around 2pm, a Detroit News photographer that Reuther invited asked the organizers to pose in front of the Ford Motor Company sign for a picture. It was at that time that a group of Ford’s Service Department– a private security force largely made up of ex-cons, professional wrestlers and thugs– approached the organizers and attacked them. The News photographer, James R. Kilpatrick, captured much of the action on film. Ford tried to destroy Kilpatrick’s photos, but a few survived and lead to the establishment of the Pulitzer Prize for photography. The photo of organizers being beaten appeared on the front page of newspapers across the country, attracting national sympathy for the organizing workers. Joe Crowley, 50, of Canton recounted a story his grandfather frequently told about UAW members intercepting a truck of baseball bats that was supposed to be delivered to Ford’s security forces. The UAW eventually won the right to organize the workers at Ford Motor Company. The first contract was signed in 1941. This entry was posted on May 26, 2015 by WMALC in Michigan labor news and tagged Canton, Dearborn, history, Michigan, organizing, UAW, wages.